I’m no musician, but I was always under the impression that they sort of kept their song writing secret until they were ready to play it to the world. If that’s accurate, new startup JamJunky may not have much of an audience. 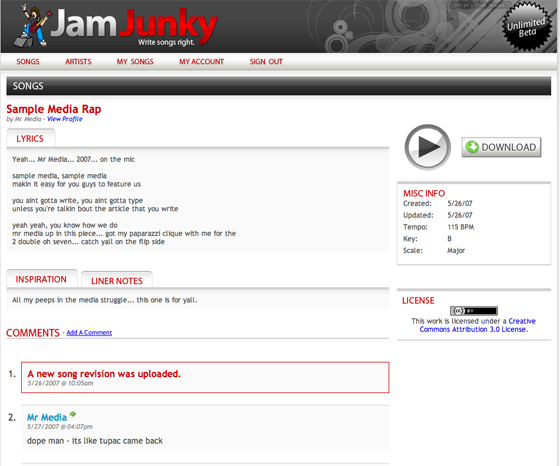 They provide a place for song writers to write their lyrics, upload songs in progress and share them with friends. Artists can also write notes about their work. Friends log in and view the work and comment on it blog-style. The artist can then incorporate feedback into the song. If there are any song writers out there I’d love to hear your feedback. This doesn’t sound like the type of environment that an artist would want to work in, but like I said, I’m no musician. CenterNetworks wrote about them today as well and included a nice overview video of the product. The founder of the company, James Thomas, also created Skinnyr.